USS Franklin (CV-13) was an Essex-class aircraft carrier launched in 1943 and active in World War II in the Pacific against Japanese forces. She was damaged in service three times, over a thousand of her crew killed or wounded, and during these battles she was the scene of heroism and great effort on the part of her crew. She was awarded four battle stars. Summer 1944. Franklin supported air strikes against the Bonins on three different trips. July 1944. She supported air strikes against Guam and Rota. July 1944. Strikes against Iwo Jima, Chichi Jima, and Haha Jima. Oct. 15, 1944, near Luzon. An enemy bomb hit the deck edge elevator; 3 were killed and 22 wounded. Oct. 30, 1944, off of Samar. 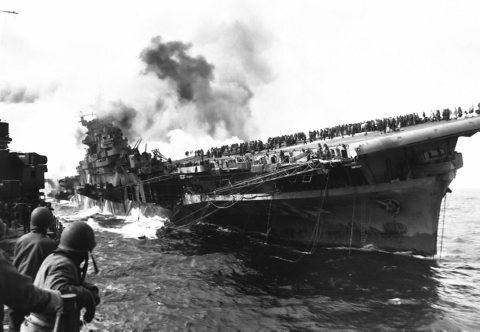 Three bombers on a suicide mission attacked Franklin; the second crashed through the gallery deck. 56 were killed and 60 wounded. March 19, 1945, off the coast of Honshu (the largest island of Japan). Franklin was hit by two aerial bombs; 724 were killed and 265 wounded. Amazingly, the ship, which was engulfed in flames, was saved by the efforts of the remaining crew.